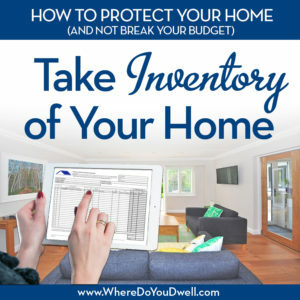 This week you’ll learn why keeping an itemized list of your home’s contents is a HUGE help when you need to make an insurance claim. No one wants their home damaged or destroyed by fire or flooding. Or have treasured items stolen from them. It’s devastating to even think about it. That’s why you – like all homeowners — rely on insurance coverage to help cover the cost to rebuild your home and replace your belongings. Having it gives you some comfort and relief, right? But even good insurance is only as good as the records YOU keep! Your insurance company can only be as helpful to you as you are to them. It’s a simple fact, and that’s why you need to take inventory of your belongings. Take a look around your home and most likely it’s filled with many different items, some worth more than others, some more precious to you, and some just part of your day-to-day life. But if you add them all up, the value of your belongings could be quite high. Are you covered for that? What happens when you need to make a claim and prove the value? It can help verify the value of your belongings when you file a claim, and even facilitate the process. Your inventory can help the claims process tremendously since there is no second guessing since you can provide both visual and documented proof. A home inventory is exactly as it sounds. Pulling together a detailed list of items in your home … furniture, fixtures, paintings, jewelry, appliances, electronics, etc. And with that making sure you take a picture and include a description, serial number, model, purchase date, and estimated value (include any receipts) for each item. Taking pictures and making a detailed list sounds difficult and overwhelming, doesn’t it? And on top of that, where do you keep these records so that they aren’t also destroyed if your home is? It actually can be quite simple with one of the online options out there. You can download an online software program, either on your own or through your insurance company, that is specifically designed to help you itemized all of your stuff! These inexpensive online programs can guide you through the process and make taking inventory of your home much easier and more organized. One program in particular that we recommend is the What You Own software. It will help you keep track of everything that fills your home. You can create a room-by-room inventory. It’s compatible with both Windows and Mac systems. Download it today for $39.99. If this type of software doesn’t work for you, you can always take the time to save your photos and lists on a safe online system like Dropbox that can be accessed anywhere. Some people even like to take a video of their home, and walk from room to room to document their stuff. Again, easy to save online. Never store your inventory list at home where it can be damaged. That’s why online programs are a great way to keep your itemized lists and pictures safe and accessible when there is an emergency. Digital records can be stored in Dropbox or iCloud. And, if you still need a paper back-up, save those documents in a safe deposit box or secured place outside of your home. Next week in our 4-week series, How to Protect Your Home (And Not Break Your Budget), you’ll find out why you just may need flood insurance for your home. You might be surprised by why it’s critical to get this added protection.